5-AAAAAA, the state-ranked Douglasville program has proven to become the model of consistency under Combs. a varsity football schedule in 1986, deflects taking too much credit for the improved gridiron fortunes of the Cougars. the Cougars to change; change, indeed, it has. honoring Combs at this time. the helm (1993), and his second in his second-to-last season at Alexander (1996). best to this day, some 23 years ago. 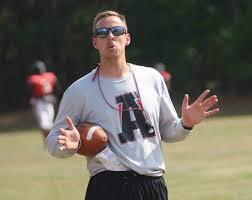 It would be hard to find a coach who believes more in the situation that Combs has at Alexander than he does. one game at a time, one play at a time, living in the moment, as directed by its inspirational coach.